Some books are very hard to review. This is one such book. It evoked so many different emotions in me that I don’t know where to start and I just don’t have the words to express accurately how it moved me. Therefore, I am afraid that this is a wordy review as I try to give you a glimpse of the visceral quality of the story. All the Light We Cannot See is engaging, beautiful, uplifting, yet heart wrenching. I would be incredibly surprised if it didn’t leave you a bit changed deep in your heart and soul. The tone is not sad. It is breath-taking. Showing that even in the deepest and darkest moments of human depravity there are parts of the soul reaching out for glimpses of good; holding on to the beauty that they have known and now crave. This story gives a very different voice to war. You are drawn into the lives of two young people who are in some respects very similar but there is an antithesis between their fates of birth. Marie Laure is growing up in Paris. Blind yet highly independent due to the creativity and pure genius of her father. Through Marie Laure you are shown the harsh reality of life in occupied France. You see the strength of the French people as they help each other to survive and go far beyond mere survival. You see their unified purpose and resolve in helping to defeat their enemies and you can’t help but cheer them on. Through Marie Laure we are given a picture of the deep history of France. You are shown the pride and loyalty of the French people to their history and culture; a history worth preserving. Werner is a young German orphan. He and his sister, their fellow orphans, and the tirelessly hardworking and loving woman caring for them are just barely meeting basic needs. Werner has a gift though which brings he and those in the orphange around him great pleasure until it is outlawed...radios. He has an incredible ability to understand electronics and because of that genius he is pushed into the war machine that was Germany far too early; at the age of fourteen. You are drawn with Werner into the depths of human nature and depravity as he finds himself caught in a militaristic system with no personal rights. He is inundated with the continual propaganda of the time; the requirement to be strong and single-minded in excellence, strength, and ethnic purity. You ache over the situations that Werner is forced into and you hate many of the actions that he takes but you are hard pressed to condemn them because he truly is a gentle soul and you know that he only has the choice of obedience or serious abuse and likely death. You can viscerally feel Werner's abhorrence of the situations that he encounters in war and his disdain for the ostentatious wealth and utter lack of respect for human life within the German elite. The most incredible aspect of the story though is how the lives of Marie Laure and Werner intersect and how they share a mutual respect for one another which for most would never occur nor make any sense at all. To recap, you will smile, you will laugh, you will rejoice, and you will shed a few tears. You are moved from rapture to despair. You experience with the characters empathy and anger, joy and loss. You see the best of humanity and the worst. All the Light We Cannot See pushes at the depths of your heart. Take a moment out of your crazy life; relax and breathe in the beauty that is this story. You truly shouldn’t miss it. 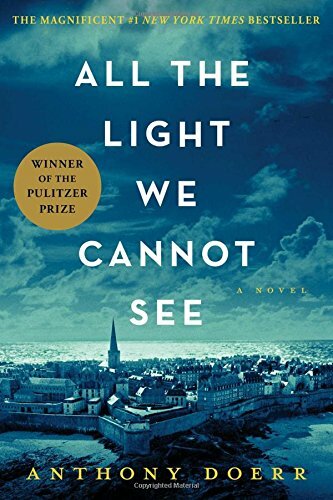 Anthony Doerr was born and raised in Cleveland, Ohio. He is the author of the story collections The Shell Collector and Memory Wall, the memoir Four Seasons in Rome, and the novels About Grace and All the Light We Cannot See, which was awarded the 2015 Pulitzer Prize for fiction and the 2015 Andrew Carnegie Medal for Excellence in Fiction. Read the remainder of his biography on his website.